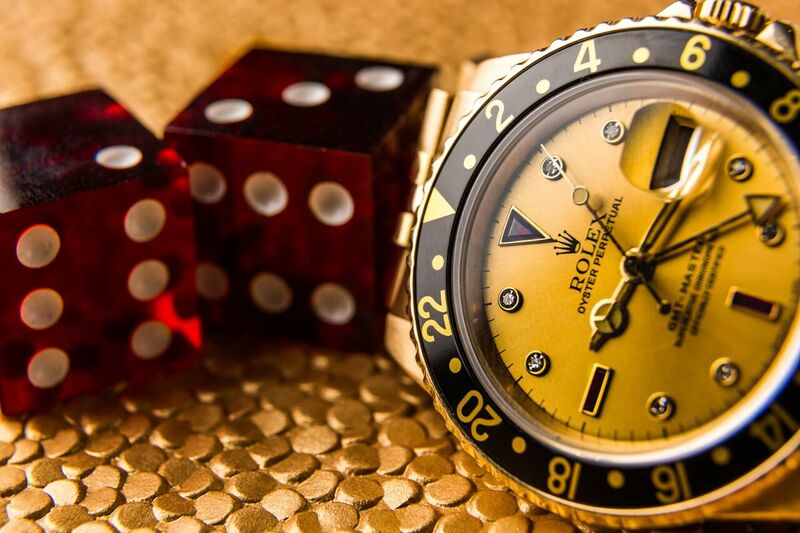 The gold Rolex has always been a universally understood symbol of status, wealth, and prestige. And while there are the traditional types like the gold President or gold Datejust, there are also more casual and sportier versions of the gold Rolex. Casual chic luxury at its finest. 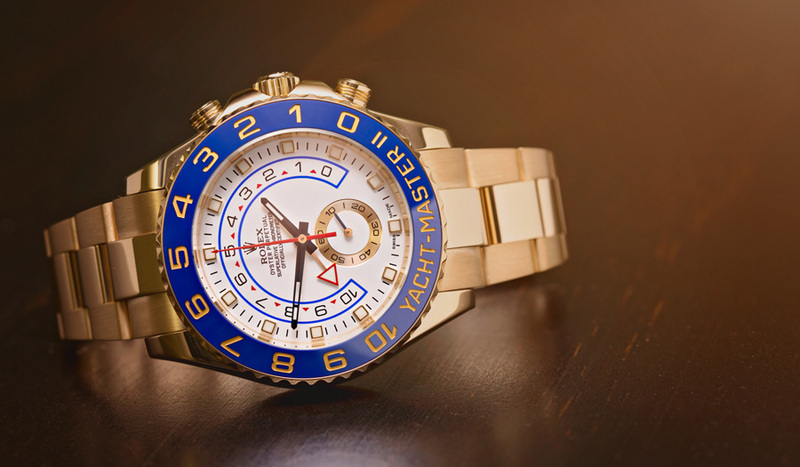 Here we take a look at some favorite gold Rolex watches that cover land, air, and sea with the Submariner, Daytona, GMT-Master II, and the Yacht-Master II. A vintage Rolex ref. 1680/3 can come in a golden fashion. As the most current version of the gold Submariner, the ref. 116618 boasts all the modern Rolex functionalities and improvements. For instance. the 18k yellow gold ref. 116618 has on top of its 40mm case the popular Cerachrom ceramic unidirectional rotating bezel. 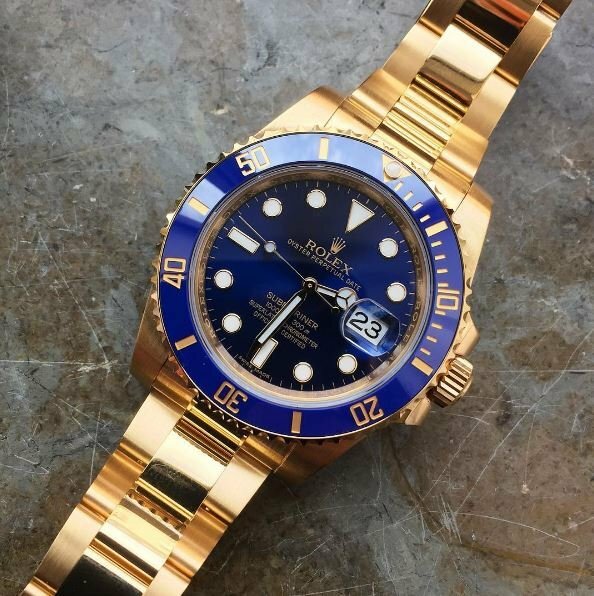 On this particular gold Rolex diver’s watch, the scratch and fade resistant ceramic bezel is offered in either blue or black. Plus, there’s the matching blue or black dial too. The blue bezel and dial configuration is especially vibrant against the shine of the yellow gold Oyster case and Oyster bracelet. Beating at the heart of the Submariner ref. 116618 is the famous Rolex Caliber 3135 automatic movement. Being Rolex’s signature diver’s watch, the Sub 116618 is, of course, water resistant to 1,000 feet (300 meters). The caliber powers the time and date functions and offers around two days of power reserve. Although, when a watch looks this good, there’s really never a need to take it off! From deep underwater, we now come to the surface with the Yacht-Master II ref. 116688—built for the captain sailing the seas. Sized at 44mm, this is the largest gold Rolex watch currently available. It is also one of the more complex models offered by the brand due to its Caliber 4161 regatta chronograph movement. The Yacht-Master II has a blue Cerachrom bezel that controls the inner movement. The 18k yellow gold version of the Yacht-Master II is outfitted with a blue Cerachrom ceramic rotating bezel. In addition to the bezel’s striking looks, it’s worth mentioning that it also controls the movement within. Aptly named the “Ring Command” bezel, turning the bezel interacts with the automatic movement to set and synchronize race start times. The white dial hosts a slew of information for the wearer, but to ensure legibility of the time, the hands are uncharacteristically in blue. The Yacht-Master II ref. 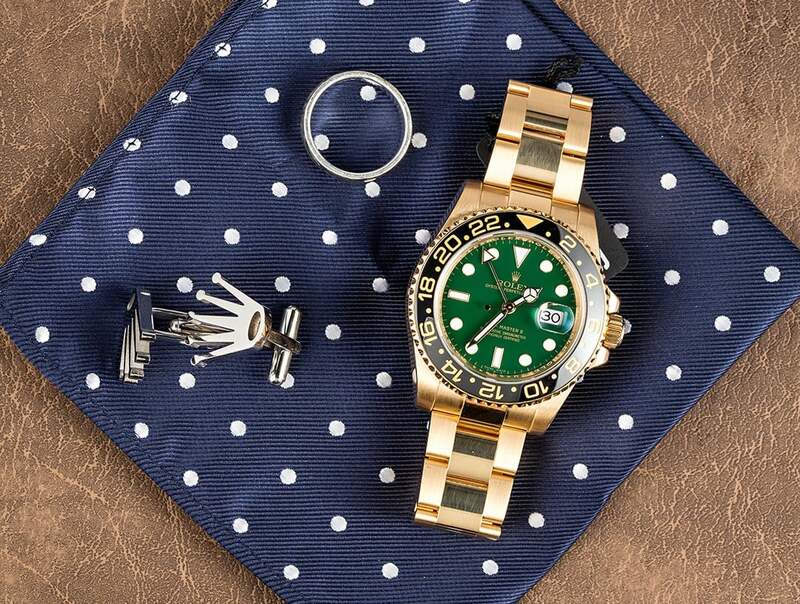 116688 is certainly one of the most aggressively designed models in the brand’s catalog and is well suited for those who want to proudly show off their gold Rolex watch. Not only is the Daytona Rolex’s flagship chronograph, but it’s also the most famous chronographs in the luxury watch space. While stainless steel versions are the most popular Daytona models, there’s something very appealing about the yellow gold references too. The Daytona ref. 116528 made its debut in 2000 and it was the first 18k yellow gold Daytona to house the Rolex Caliber 4130 manufacture movement. The first 18k yellow gold Daytona to house the Rolex Caliber 4130 manufacture movement. 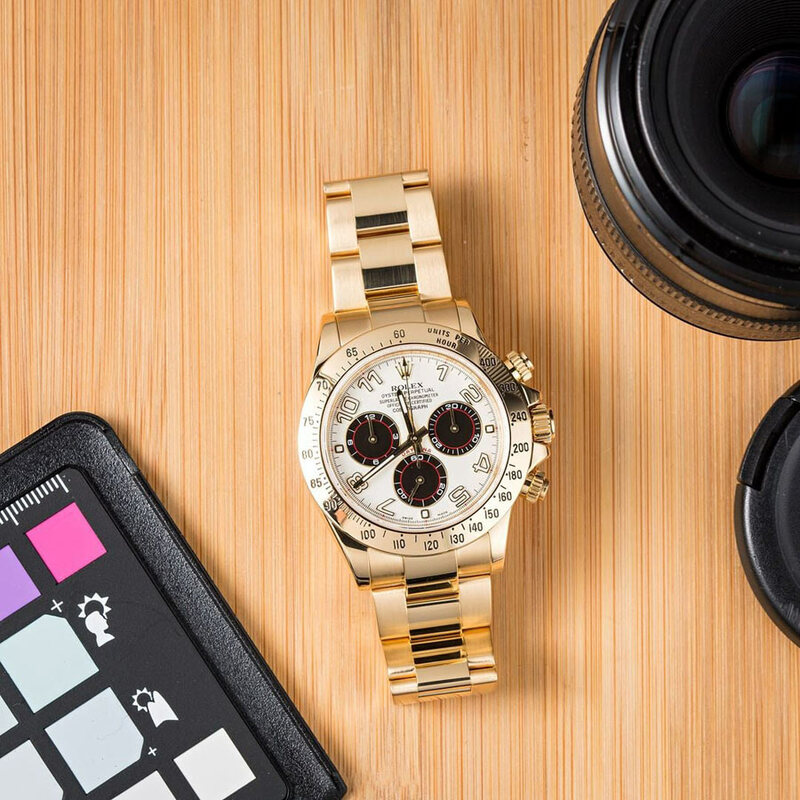 Like other gold Rolex Daytona watches, the ref. 116528 came with different dial options. The version seen here with the white dial, Arabic numbers, and black and red sub-dials is particularly sporty. The 40mm Oyster case and Oyster bracelet are both constructed in 18k yellow gold. The ref. 116528 is a very fine example of an ultra luxurious Rolex Daytona chronograph. From land and sea, we now travel up to the skies with a gold Rolex GMT-Master II. The ref. 116718 with the green dial is the 50th anniversary model of Rolex’s iconic pilot’s watch. With its release, the ref. 116718 introduced plenty new features, signaling the start of the newest generation of the GMT-Master II line. For example. the GMT-Master II 116718 was the first Rolex to sport the Cerachrom ceramic bezel. Furthermore, it had the bolder “Maxi dial” with larger lume plots and broader center hands. The Oyster bracelet was also revamped to include a more solid clasp similar to the Daytona, as well as polished center links. Anniversary Rolex GMT-Master II ref. 116718 is a pilot’s watch. The green dial and black bezel combination of the ref. 116718 anniversary look especially great against the yellow gold 40mm Oyster case and Oyster bracelet. A special anniversary deserves a gold Rolex watch as memorable as the GMT-Master II ref. 16718. GMT-Master ref. 16758 with a Serti Dial is extra golden with its gold dial. 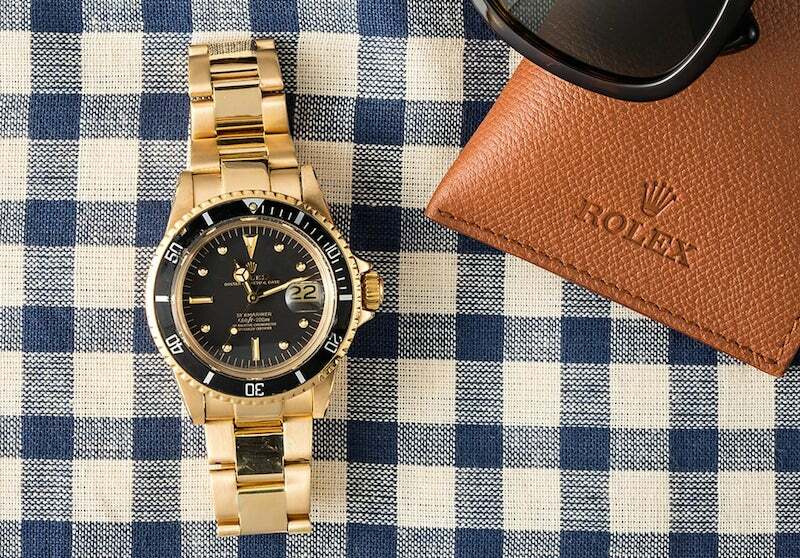 Do you have a favorite gold Rolex sports watch? Leave us a comment below!